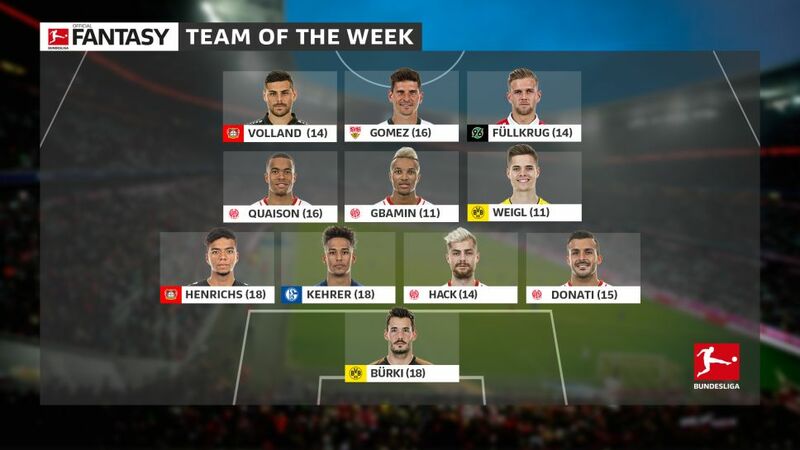 From Borussia Dortmund goalkeeper Roman Bürki to Hannover front man Niclas Füllkrug, our Matchday 23 Team of the Week is all about some of the current Bundesliga season's unsung heroes. It takes a special performance to outshine a first Marco Reus goal since May 2017, but that's exactly what Bürki did in Mönchengladbach. The Swiss custodian pulled off one stellar save after the other - a season-high 11 stops no less - as Dortmund moved up to second in the standings courtesy of of a hard-earned 1-0 win. No wonder he was named the Bundesliga's Man of the Matchday. One of four Mainz players to make the side, Donati registered his first assist of the campaign for Robin Quaison's opener and won 10 of his attempted tackles in the 05ers' 2-0 win in Berlin. Dominant from start to finish in the capital, Hack barely gave Salomon Kalou and Co. a sniff. The 24-year-old won a game-leading 72 per cent of his 18 attempted challenges as Mainz recorded their first clean sheet since beating Cologne on Matchday 12. Henrichs chipped in with an assist, won more challenges and had more touches than any other player on the pitch in Leverkusen's 2-1 win at Hamburg. A 16th-minute substitute for the injured Wendell - imagine how many more points he might have garnered if he'd started. Adding meat to Dortmund's defensive bones in Gladbach, Weigl won a match-high 19 of his attempted challenges at the Borussia-Park. Enough said. Gbamin put in a tireless shift for Mainz in the capital. The Ivorian won 12 tackles, grabbed an assist and weighed in with a couple of efforts on the Hertha goal. Forget Manchester City slayer Will Griggs: Füllkrug's on fire! The German striker's 10th Bundesliga goal of the season rescued a point for Hannover in Cologne, and he even had a hand in more attempts on goal (seven) than the entire Cologne team (six). Volland did a similar job for Leverkusen in Hamburg, albeit without scoring. The 25-year-old laid on more goal attempts (four) and won more challenges (21) than any other player at the Volksparkstadion.